The viability of art education programs are entering a critical phase in significant numbers of school districts across the United States. As state revenues decline and school budgets, presently cut to the bone, shrink even further, many decision makers responsible for shaping curricula may be tempted to marginalize formative growth experiences necessary for fully developing the intellectual capacities of children. When I think of most of the educational activities in today’s K-12 schools, I think of children’s intellectual capacities developed primarily through listening, reading and writing symbolic forms of linguistic and mathematical information. Children spend much of their time in school completing digitized test prep learning activities or paper and pencil selected response work sheets designed to prepare them for high stakes testing events. Learning today in most U.S. classrooms requires children to place a high priority on information processing. Don’t get me wrong, it is the role of educational institutions to impart knowledge and skills upon young learners however, one of the problems with information processing is this: human beings are hard wired to actively think, imagine and express personal ideas. 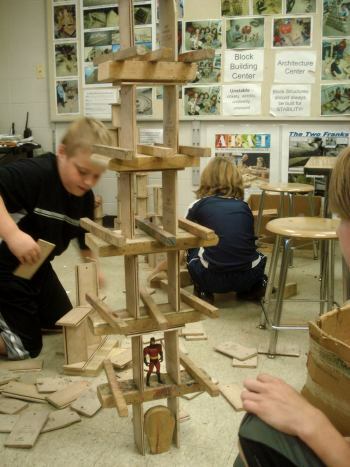 In addition, non consensual rote based learning activities tend to dull the refinement of divergent thinking capacity. It is hard to promote creative growth if children are deprived of learning experiences that do not stimulate this critical area of the intellectual realm. Creativity will be an important component to the success of our future citizenry. Higher level thinking skills related to creativity cannot be developed if children are deprived of experiences because of policy maker’s preoccupation with high stakes testing. 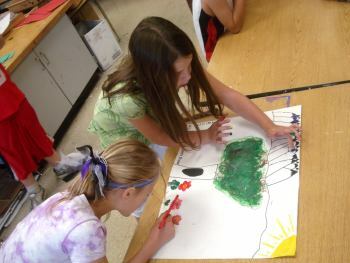 Within schools, the art room is that unique place where children are allowed to experiment, imagine, create and express personal ideas using a myriad of forms, materials, artist’s techniques and technologies. Much of visual arts education learning requires students to execute the steps to represent and convey ideas in two, three, and four dimensions. This requires individuals to develop the ability to focus their attention on a vast array of quality control details. The assembly of these qualities within an art work requires a synchronization of consciousness with one’s imagination and the sensory, emotive and cognitive realms. Research in physiology by 2000 Nobel Laureate, Eric Kandel showed that stimulating sensory based learning activity boosts long term memory formation in neurological structures by the extra production of the neurotransmitter serotonin. Neural networks are strengthened and expanded when learners are engaged in sensory based learning experiences. Scientists and researchers using the latest medical imaging technology report rhizome like bundles of neural pathways interconnected within the human brain, illuminate like Christmas tree lights when subjects are engaged in stimulating learning activity. Likewise, the neural pathways are dimmed when cognitive activity is passive or repetitive. From this educators perspective, Kandel’s research means regular opportunities for sensory based learning through art education are critical in today’s schools for children to develop a full range of intellectual capacities in order to become the creators, inventors and innovative thinkers of the next generation. The hands, eyes, ears and body are the agents of cognition. Art teachers do not boast when claiming visual arts learning experiences can lead to transformational change within their students. According to the High School Survey of Student Engagement, educational experiences where students are reduced to passive recipients of knowledge produce learning experiences that are inadequate and unsatisfactory to significant numbers of children. Regular fine arts experiences in our schools matter because without them, educators run the risk of dis-engaging learners and providing a schooling experience that goes into one ear and out the other. Children thrive in school environments when they have access to the fine arts and the development of the whole child cannot take place without such programs in place. From an economic development and sustainability standpoint, a citizenry populated with creative, divergent, imaginative thinkers will be most beneficial. Ideas and intellectual property dependent upon creativity will become assets in the new economy of the 21st Century. The refinement of the imagination as developed through the visual arts will provide future designers, engineers, scientists, entrepreneurs, innovators, professionals and others with the creative edge they will need to compete in an increasingly competitive and uncertain future. Brainstorming without perceptive, imaginative and creative counterparts becomes an exercise of inconsequential group think. Eisner, E. W. (2002). The Arts and the Creation of Mind. New Haven & London: Yale University Press. Gajdamaschko, N. (2005) "Vygotsky on Imagination: Why an understanding of the imagination is an important issue for schoolteachers." Teaching Education, 16(1), pp. 13-22. Kandel, E. (2006) In Search of Memory: The Emergence of a New Science of Mind. New York, W.W. Norton & Co. Inc. Winner, E., Hetland, L. (2007) Art for our sake. NAEA News 49(6). Reprinted with permission from the Boston Globe.